Yesterday, Washington’s Cardinal Donald Wuerl celebrated Mass to mark the opening of the academic year at the Catholic University of America in Washington. But he took a moment at the ceremony’s conclusion to make a personal and impassioned plea. The brief video below is worth watching and sharing. It speaks to the conscience of the world. Often we’re asked, “How is it possible that in human history atrocities occur?” They occur for two reasons. Because there are those prepared to commit them and there are those who remain silent. And the actions in Iraq and Syria today, what’s happening to women, children, men, their displacement — as the least of the things happening to them — is something that we really are not free to ignore and sometimes all we have to raise is our voice. Keep our suffering brothers and sisters in Iraq and Syria in your prayers. And, if you can, please remember them in a special way by making a gift to support the work of CNEWA in Iraq. Visit this page to learn how. Reports emerging from Syria indicate that an important Christian stronghold — the city of Mhardeh and nearby Hama — have been surrounded by ISIS and the Al Qaeda-backed rebel group Jabhat al-Nusra. The swift deterioration of the situation in the west and north of Hama’s countryside [comes] as anti-regime forces — including Jabhat al-Nusra — advance toward the Christian city of Mhardeh, which overlooks Al-Ghab Plain, as well as in the direction of Hama’s military airport. The militants began carrying out unprecedented attacks using BM-21 Grad missiles targeting the regime’s sites surrounding Alawite-majority towns in Masyaf city and Al-Ghab Plain. Moreover, civilians have started fleeing Alawite villages that are located near battlefields such as the town of Arza near Hama’s military airport, which has been deserted. “People are carrying arms at an increasingly rapid pace, while many families owning real estate in Tartous and Latakia have deserted their homes. The situation has become alarming in this region, especially since many residents expect Jabhat al-Nusra to commit massacres there, should it progress in the region. This will be in retaliation for the massacres the group accused the NDF of committing in Sunni towns — mainly in the towns of Tremseh and al-Lataminah in 2012,” he said. A quick tour of the Alawite villages in the west of Hama’s countryside is sufficient to notice the extent of tension and alert among people, as dozens of checkpoints are deployed along the roads, while cars and pedestrians are being thoroughly searched. The cease-fire that took effect 26 August calls for the easing of the Israeli-enforced embargo to allow humanitarian aid and construction material into Gaza under strict monitoring. Egyptians, who brokered the cease-fire, will open the Rafah crossing into the Gaza Strip. Terms also include enlarging the offshore zone for Palestinian fishermen to six miles. The agreement was the latest of numerous attempts to end a seven-week conflict in which more than 2,100 largely civilian Palestinians and 70 Israelis, including 64 soldiers, were killed. The organizations have coordinated their aid efforts, with Caritas Jerusalem focusing on food and cash assistance while Catholic Relief Services is distributing nonfood items and CNEWA is assisting with repairing damaged homes and institutions. Father Raed Abusahlia, director of Caritas Jerusalem, said his agency’s long-term emergency appeal would last until Christmas. He said Caritas will provide food to 2,000 families as well as a cash distribution about $350 to all the Christian families in Gaza, with specific emphasis on those who lost all of their possessions and homes. Caritas also will provide all the necessary school supplies for the students of the five Christian schools in Gaza, although it is not clear when school will begin. “At the same time we have already sent three truckloads of food, diapers, milk and hygiene supplies last week,” he said, noting that the almost $84,000 worth of supplies came from local Catholic parishes as well as four Israeli groups. El-Yousef said response to CNEWA’s earlier appeal for help from its donors has surpassed expectations, largely thanks to donations from European donors; he said donations would soon top $1 million. He added that the money will be largely used to help rebuild and rehabilitate Christian homes and institutions damaged during the conflict. To learn how you can help Gaza’s traumatized families, please drop by our giving page. 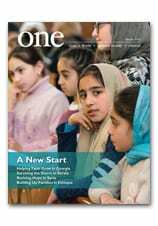 In the Summer edition of ONE, writer Jose Kavi explores the life and times of “untouchable” Christian Dalits. Here, he offers further insight into what he saw while covering the story. I was happy when I was asked to write an article Dalit Christians. The Indian Church has been demanding justice for its Dalit members for nearly 65 years. An estimated 70 percent of Christians in India are of Dalit origin, mostly in the Latin Catholic Church and Protestant denominations that were introduced in India by Western missionaries. The presence of Dalits among the Eastern churches, both Catholic and Orthodox, is around some 20 percent, concentrated mostly in Kerala, the church’s base in southern India. It is hard to identify these people of former low-caste origin, since they are well integrated into the mainstream churches. So to write this story I turned to northern India, where the Syro-Malabar Church has several dioceses. Both Archbishop Kuriakose Bharanikulangara of the Syro-Malabar Catholic Eparchy of Faridabad and Bishop Aboon Mor Barnabas Yacob, the Syro-Malankara Catholic Church’s apostolic visitor to North India, said their churches are currently focusing mostly on their people, who have migrated to northern India from Kerala. However, they do support the church’s Dalit struggle. Photographer John Mathew and I asked priests in the Bijnor Syro-Malabar diocese if they are doing anything for the Dalit people. They said they have a few local converts but were not sure if they belonged to any Dalit communities. The diocese covers Uttarakhand state and parts of neighboring Uttar Pradesh. We decided to try our luck and set out to Gangapar-Birbhanwala, the diocese’s newest parish, in Uttar Pradesh. And it was a journey into new world. After traveling about five hours, we left the highways to enter a narrow dirt road. It took an hour to cover the 12 miles. We stopped at a bridge in Dhampur built over the Ramganga, one of the tributaries of the Ganges. Its blue and clean water gave us our first shock of the trip. The Ganges we have seen downstream at places such as Varanasi and Patna is no better than a sewage drain. The new government is planning to spend billions to clean up the river Hindus consider holy. The Rev. M. J. Joseph, the young parish priest who came to the highway to guide us, said the river had changed its course only five years ago after a flood. The flood had washed away the road to Gangapar. We negotiated through farms and gutters and reached a tiny shed in the middle of an open field as the sizzling summer sun blazed above us. “It is the parish church,” Father Joseph said with an apologetic smile. The tin-roofed shed has no cross, a normal sign of a church. There is no altar. The only Christian reminder is a painting of Jesus on the shed’s only wall. There was neither electricity nor running water. Our driver had to go to the nearby forest to answer nature’s call, as the place has no toilet. Jarnail Singh, the church’s caretaker who lives in a room attached to the church shed with his wife and two children, asked his daughter Pinky to bring us water, which she did from the hand pump near the entrance. Jarnail’s wife, Malkeet Kaur, readied the lunch by the time we finished exchanging pleasantries and conducting a few interviews. The special dish for the visitors was scrambled eggs. After the lunch we set out for the villages. Most people live in thatched mud huts. Piles of cow dung cakes used as fuel and haystacks welcomed us at every entrance. Water buffaloes were tethered to poles near the huts. You could see charpai, the traditional cot that doubles up as sofa and bed, kept in the front yards. Despite such dreary existence, everyone we met, including the aging Mahinder Singh, looked cheerful. He described his escape from Pakistan when the Indian subcontinent was divided. “I was so thirsty and went to drink from rivers, but they were filled with corpses. Then I went to wells, there also were dead bodies,” he recalled. “Prabhu Jisu” (“Lord Jesus”), he answered. Read more about Dalit Christians in Caste Aside from the Summer edition of ONE.